Select a feeder with perches. These allow hummingbirds to rest while feeding. If you have several feeders, place them at different heights to avoid hummingbird confrontations. Fill the feeder with a solution of one part white table sugar to four parts water. Boil the water before adding the sugar. This will drive off chlorine and fluorine gasses and kill any microbes. Excess solution can be refrigerated. Do not use a white sugar substitute. Honey contains fungi that will sicken and kill hummingbirds. Taste tests show plain white sugar is preferred over any other. Sugar water ferments quickly and mold appears overnight in warm weather. If feeder is in full sunlight, assume a temperature of at least 90 - 99°. Clean the feeder by soaking it in a solution of 90% water and 10% vinegar for at least eight hours. Use a glass jar, plate or bowl to hold the plastic parts under water. Then rinse well. This will kill harmful microorganisms. Do not use any petroleum-based products such as Skin-So-Soft or Vaseline on a feeder. Hummingbird wings will accidentally brush against this substance and it will be ingested when the hummingbirds are preening their feathers. If you have a bee or wasp problem, try a saucer-shaped feeder with no vertical solution bottle. These keep the sugar water level below the reach of bees and wasps. If you have an ant problem, use a feeder with an ant moat around the top attachment point. Place soapy water or a commercial product such as Tanglefoot in the bottom of the moat to snag ants. The sides of the ant moat will keep hummingbird wings away. Since insects are attracted to the color yellow, choose hummingbird feeders without yellow parts if possible. Keep all feeders more than 6 feet off the ground and away from anything a cat can perch on. Hummingbirds have been snatched by cats, frogs and even praying mantises. 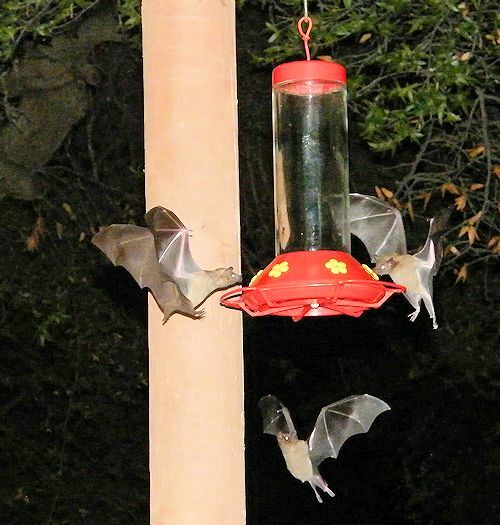 If a feeder seems to empty quickly overnight, the cause is probably bats. Two nectar-feeding bats are found in the desert southwest: the Mexican Long-tongued Bat and the endangered Lesser Long-nosed Bat. They normally feed on agave, saguaro bloom, organ pipe and cardon cacti. As adults, they are larger than insect-feeding bats. They rely on eyesight and do not use echolocation. Note the small ears in the picture below. Bats and hummingbirds are not usually harmed by sharing a feeder with each other. Lesser Long-nosed Bats at hummingbird feeder.